Can you quickly summarize what has changed and what has not? There is no flails in the list of mundane weapons above...? Flails will no longer exist as mundane weapons in the core rulebook in T9A 2nd Edition and instead the units that had flails now will most have great weapons instead. It was felt as an underused option, only used in very specific cases, and only in a few armies and then only on characters. Vermin Swarm is an exception to this as they will keep Plague Flails as an army-specific weapon. Why haven/t you used the opportunity to redesign Great Weapons now that you have the split of S and AP? It's tempting to take the opportunity the strength/AP split creates to redesign great weapons. At first sight, it looks like the obvious choice. However, the more you dig into this, there more you will realize it creates lots of new problems. We went thought this line of though ourselves. What if we make great weapons +2 (+3) strength but only +1AP? - This creates *huge* buff for anything with high armour. And we do not think making the best armoured units better is the right move for the game. Well, what if we also change halberds to give +1St +2AP then? - Then we turn halberds into an awesome weapon. Easily the best weapon. We are back to square one with a single weapon being stronger than all other weapons. Do halberd units need this boost? Generally not. Could be countered by giving halberd "strike at ini 0", but then we move halberds and great weapon closer to each other with pretty small differences between them. We'd rather see different weapon fill different purposes and roles. What if we instead turn GW into +1 strength, +2 AP? - Repeat the same thought-process as above, but this time giving high T units a huge boost. The thing is, great weapons are not only a good weapon. They are also an important part in keeping high armour and high toughness units in check. We should ask ourselves, is there actually a problem here? - Are GW un-immersive? No really. - Are GW the best weapon?If yes, is there a problem if one weapon is "the best"? Here we claim the answer is "not always", and "not a problem if some weapon is the best". There are lots of examples where great weapons are not the best or most used weapon. An several examples of where this is not due to pricing. - WDG warriors pay more for halberds and halberds are more used weapon. - EoS Electoral Cavalry must pay to replace GW with lances, and they often do. - Long horns often use halberds. - Centaurs are seldom used with GW. - OK and BH character often use iron fists and beast axe over GW. If looking at units who has to pay for their great weapons, there are countless examples of units choosing other weapons most of the times. So, stating that great weapon is the best weapon is not always true. Great weapon is the best weapon for units that don't die easily, and/or have low initiative, and/or can't have shields. - on shock troops with good charge range, lance is the best weapon. - On small MSU style combat units, paired weapon or maybe halberds are the best weapon. - On tarpits, HW/shields are the best option. Why is it a problem that GW also has a niche where it is the best weapon? In our opinion, that is not a problem. It is a good thing. It creates units with different roles, different strengths, weaknesses, counters etc. It makes the game deeper. It's more important to spend magic item allowance on defense than offense. Character can get very good defense, which makes drawback of striking last pretty small. [lexicon]Great weapon[/lexicon] becomes the obvious choice for anyone who don't need the [lexicon]shield[/lexicon]. What are we doing to mitigate this? All the best defensive items are nerfed or removed. Bluffer's and 4++ Talisman are gone, and reroll armour save is on a shield, so you can't take that with great weapon anymore. The best defense is brought down a notch, making striking first more important, thus making great weapon less desirable. The other move is to make magical weapons into enchantments that can be used with different weapon types, making it easier to take magical weapons on characters. This in turn makes character generally more killy, which makes striking first more important. There are also a couple of weapon enchantments which are aimed at making non-GW weapons desirable. Might of titans, blade of power, Razor Edge and Hero's blade are all weapon enchantments with diminishing returns on great weapons. Now, why are you changing the Spear rules? We've found in the current v1.3 rules set that Spears are too much of a hard-counter against Cavalry, and this has negatively affected the use of cavalry units across most armies. We wanted Spears to have a unique role, but we wanted to explore a set of rules that was more widely applicable and less counter-specific.We wanted to keep spears as a good (but not as good as before) tool against cavalry. It also makes sense, immersion-wise, that the rules represent how spears may be used to impale their enemies when being charged, allowing to hit before they are being hit and making it easier to penetrate the enemy's armour by using the momentum of thekr charge. As you can see, now Spears have permanent AP1 and they get additional bonuses when they are charged. They not only gain a second point of AP, but also gain +2 Agility when they are charged. This is specially important since in 2nd Edition rules the units which charge receive a +1 Agility bonus. Spear units will be able to have a bonus to Agility that counters the charging bonus and will also be more efficient punching through armour the turn they are charged, as they are able to use the momentum of the charging enemy against them. Note that fast units, and specially lance cavalries, will benefit greatly from this +1 agility bonus, as these are units which you will usually see charging. So what about the changes to Paired Weapons, why is that? Paired Weapons have been changed because of two main reasons: Immersion and to not overlap with the new spears. It didn't make sense that paired weapons were the "strike first" weapon, and that spears were not. It made more sense that paired weapons represented instead and offensive trait with unstoppable flurry of attacks. That is why, rather than having an initiative bonus, they will now offer a more unique role in the form of a bonus to offensive skill and will be able to ignore parry (new parry rules displayed below). The wielder gains +1 Attack Value when using this weapon. Attacks made with a Paired Weapons gain +1 Offensive Skill and ignore Parry. A model using this weapon cannot simultaneously use a Shield against Melee Attacks . Paired Weapons ignore Parry, but what are the new rules for parry? With the change to the Offensive and Defensive skill profile attributes, the parry rule needed to change. Different rules were explored, including boosts to the defensive skill value. Increases of +2 or +3 Defensive Skill where discarded as that could become too good on characters, defying the initial purpose of parry which is to grant a defensive boost to tarpit and anvil units. Parry can only be used against Close Combat Attacks from the Front Facing. Models with Parry gain +1 DefensiveSkill, or their Defensive Skill is always equal to the Offensive Skill of the attacker, whichever is higher. Ohh and did we mention that parry now works with Magical Weapons? So now that you have explained the mundane weapons, can you tell me about the weapon enchantments? That is probably what you where most certainly awaiting: a view at the new magic enchantments, which will be covered in this and in future BTS publications. This is the time for weapon enchantments! Note that the names are WIP and that points are not provided as those are being playtested internally at the moment. While the description of the enchantments is unlikely to change much, those should also be treated as WIP because things may be identified through internal playtesting. For example, Hero's Blade feedback is been reviewed at the moment and the team is assessing to limit it to "Hand Weapon and Paired weapons only". I think the idea is not to make a single weapon better than all the others, but to let each of them have their own niches. Lol @ Lightbringer - love it!!!! The lance is pretty meh. Consider this for a second. Your Average destrier weighs 2k lbs with an average speed of 25-30 mph. Assuming KoE horses are the best in the old world per the fluff that means we are at the high end going 30 mph (48 kmh) Full Tilt. A knight in full arms and armor is going to weigh close to 300 lbs add another 70 lbs of barding. This is a total of 2370lb (1075.01 kg), with a mass of 109.69kg. Which means the impact Force of the point of a lance is roughly 11607.34 LB (5265 KG). Your man isn't parrying a lance. you're missing the point that its a dice roll, some are going to fail, some are not. The examples are also charging a spear-wall, which normally have more length than a lance. Then couple in the fact you love logic, this is also why the horses have attack rolls, because the spearman can punt the rider off but still die to a horse smash. Its not hard to imagine the dice rolling, letting one dude sidestep a lance just for the guy behind him to kill the rider and catch a barded steed to the chest and dying. Its a dice game. A narrative dice game. So we are going to use #Logic to justify making spears crazy overpowered yet say "It's just a game bruh" to justify lances being garbage? So you only can charge slaves flacks and other S3 no fanatic or heros in corner things. If you charge on the flank of spears they don't get +2 ag. Am I reading this correct? Do spears now work in every direction? In my optinion the bonus should, as is now, only apply if charged in the front. Thank you very much. I thought so but was not certain. I disagree on the explaination on removing Flais, and I know my gaming group agere with me. What about KoE EoS WotDG That used flails on some iconic units. And i dont buy you reasons for not changing Greatweapons, Imo it makes no sense that it has +2 str when a halberd only has 1. in Real life they are very much the same.. i feel the death Fog creeping in. Am I the only one who thinks that printing weapon enchantments on a Great weapons seem way to strong? I mean S+5 or S+2+Kingslayer... Seems that these easy high strength chars (even with S4 basic chars (like elves)) will undermine high toughness values significantly. What do I miss? You miss that it won't really touch armour - so yes they might be wounding on a 2+, but you're left with a decent armour save. And how often do you really need a Strength above 6? You pay extra points for something that you may use if the opponent has high toughness, low armoured troops and they make the mistake of letting your killy guy near them. You need at least S8 for everything with T6 - It seems that the models with T6 or higher mostly rely on Toughness more than Armour. So you got Dragons (3+ Armour), Spinx, Rock Idol etc... nearly everything with high toughness comes with quite low armour. I do not really see why you should be able to create S9 or S10 Chars at all!? And please keep in mind that a Char with base S5 with Great weapon already has AP4 -> that is quite enough to threaten even high armoured models. Please also do not open side topics the like "you do not need to let the char get you" - Sylvan Lord on Eagle with S9? Why should that be possible??? Strength no longer adds AP. If the description does not mention AP, then it adds no AP. @cyprinus I think we all did understand that and furthermore related our argumentation to this. So what is your point exactly? Will there be different prices depending on the weapon that is enchanted? Or does all those special weapons go up a lot in price? 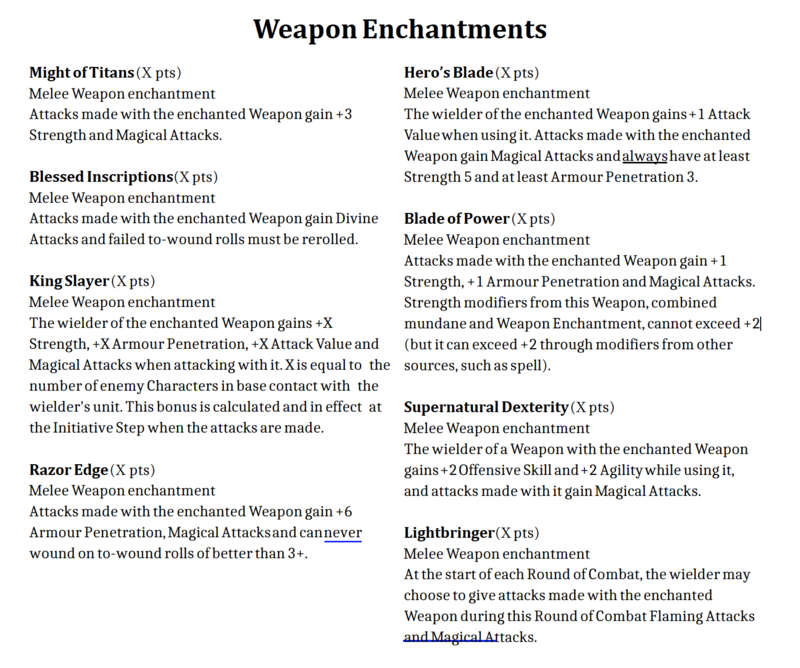 Seems to me, that some of these weapon enchantments just cry for being enchanted on halbards or GW to realy get a deadly weapon. Not so much when you enchant paired weapons or hand weapon. Too bad the flail is gone, I really liked that offensive power at a different cost than the GW. And it's too bad the lances didn't get any change, they had alot more need of that agi buff than the spear. The spear allready is one of the top weapons, while the lance is at the bottom. Ofcourse the balance comes down to how you price these weapons in 2.0, but it is kinda silly that charging cavalry with lances gets killed by swords before the lances hit. This +2 agility for the spear is just so logic.. thanks for that! In reality, How is possible for a cavalry to hit first when you have a wall of spears front of you. Yeah so... blessed inscriptions... how about that be limited to hand weapon only eh? Reroll to wound holy attack s7 greatsword on a saurus ancient with Ows 6 with reroll 1 to hit? Or in short reroll everything expect 2 to hit? 9th Age gets better everyday. Keep it up. What about my flaggelants? Will all my GW figures lose their lovely flails! can I take paired weapons with 2 enhancements? So GW with Blessed Inscriptions is the new cool now. The +1ag on charge is huge though. Just dont charge the spear wall. @'zertuiop' I've got VS so I do not care really. However my greatest concern is that there will be only spear walls around. Spears may be just too universal for cheap infantry with no obvious drawbacks. We'll test and see. Initiative (maybe with (ap 1 or 2 in first round also) IS a unique offer for glass cannon reckless infantry that rely on beating enemies in 1 round. If they dont i am screwed but at least i get a really varied choice. Strongly advise that this is reconsidered.